Founded back in 1993, Women Chefs & Restaurateurs acts as a resource to female food professionals by offering scholarships, mentoring, and networking opportunities. Their annual conference—which takes place next month at the InterContinental in Century City—is a three-day event that will feature speakers like Nyesha Arrington, Bricia Lopez, and Margarita Manzke to name just a few. There will also be cooking competitions, an all-woman food truck invasion, and panels on everything from aeroponic gardening to earning fair compensation. 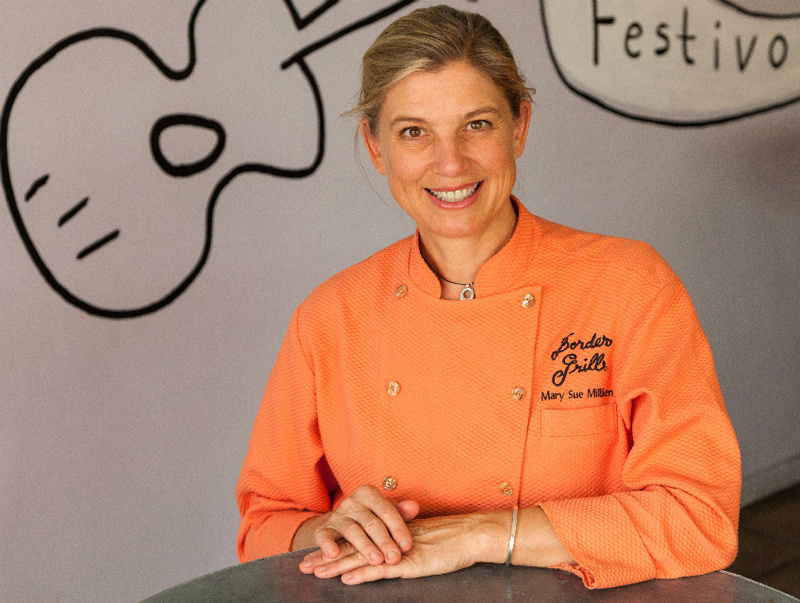 We sat down with Mary Sue Milliken, co-owner of Border Grill, L.A. star chef, and one of the original founders of the WCR, to talk about the state of women in the professional kitchen and the industry as a whole. Q: Why is it important for you to be a mentor to other women chefs? A: I was lucky to have lots of mentors in my career, mostly men but a few women. You know, I just feel so fortunate to have the career I’ve had—and I’m going to continue to have, hopefully—and I just want to give back in every way. That’s why I’m involved in charity work, that’s why I do a lot things, but I do find that when I mentor young people, women, or girls or boys, I get a lot out of it myself. I guess there’s something about teaching that, you know, just verbalizing why you cook a certain way or why you manage people in a certain way, those things really are helpful to myself because I get more committed to why I do things. Explaining those little nuances is really good. I love to teach. I’m a problem solver, so when people come to me and say ‘What should I do with my career?’ I enjoy brainstorming. Most often, I don’t know the answers, but just that human connection—someone talking to you, you talking to them—they arrive at their own answer is what usually happens. I do like it. I like that connection, I guess. Q: Do the young women chefs you mentor mention the obstacles they face being in a male-dominated industry? A: Some do, and some don’t. I think there’s a certain benefit to not acknowledging that things aren’t quite equal. Because if you don’t acknowledge it, you have a little more energy to put towards bulldozing your way through. In the early days, that’s what I did. But, I think things have changed a lot since I went to chef school in 1977. There is a whole new generation of women entering the food industry, and they’ve grown up in a different world, where they, hopefully, many of them were given culturally more confidence than my generation, and our generation had more than my mother’s, so I’ve seen a steady progression, and I think that women are still not as confident in entering any work force, especially a male-dominated field like the food business. Some women will choose to just put blinders on and go for it, and others who—and I think there’s a balance between the two approaches—are more aware and fighting for equal pay and equal attention. It’s a tricky thing in trying to get equal recognition. A lot of it is how we project ourselves and how much confidence we put out there, so I think it’s an interesting time because it’s not as quick as I thought it would be when I started. I thought we’d be further along 35 years later, but I think there are improvements, less quick than I would have imagined. Q: Do you feel that you’re a pioneer, or is that a weird moniker to give yourself? A: Well, I mean there were women doing “men’s jobs” long before me. You know, Madame Curie and Julia Child, but they were rare, and nowadays, it’s less rare, and as a culture, we’re studying—I’m a real science person, I love science—we’re looking at gender and looking at the workforce, the economy, and the way gender effects those things in a new way, a more scientific way. I think, I was early into a male field pretty much. I mean when I was in chef’s school there were two women in my class of a hundred, so I guess, in some ways, I do feel like a bit of a pioneer, but I also think there were people, like Alice Waters was ahead of me. I looked towards her and what she was doing, and there were a lot of women chefs in France. There was a whole book called The Great Women Chefs of France that I bought in 1977 or ’78, and I went to work for the woman on the cover of the book, so there were plenty of people for me to look towards, but it still was very uncommon. When I told my mom I was going to be a chef, it was the same as saying I was going to be a plumber or an auto mechanic, you know? I’m going to go into this man’s field to do this thing. Q: You and Susan Feniger are on TV so often. Do you get young women writing to you? A: We do. We get some young women writing to us, but we get both genders, to be honest. Q: So men don’t have to idolize only male chefs anymore? I’m so fascinated. I think gender is going to be looked at and examined differently come another couple decades, I really do. You see it already. Of course, we live in California, and so we’re pretty open minded and liberal about that stuff. I do see, and I’ve felt for a long time that the restaurant industry attracted a lot different kinds of people that didn’t fit anywhere else, maybe, and we all kind of feel like a family—a dysfunctional family, but I think that’s what the restaurant business has been historically. I’ve always been around a lot of people, men and women, and once you get through a certain barrier and prove that you’re hard working, smart, and dedicated, and willing, and an asset, then pretty much wherever you are, you’ll get the training you want. I think where women are falling short, and where I’ve fallen short in my career, is that you get the training you want, and the attention you want, but you wouldn’t get the promotions, you wouldn’t get as much opportunity or probably equal pay. I think that’s partially our culture and partially that fact that women from the time they’re born aren’t given the same amount of confidence or they’re not looked at in the same way, so we’re not as assertive. Q: Does the fame and respect you’ve earned inoculate from some of the sexism in the industry? A: I don’t think we’re insulated. It’s still hard in business, getting bank loans, insurance—the things I can’t stand—I just have this sense that it’s easier for men. I don’t know if that’s exactly true, but that’s what I sense. You know, negotiating leases. Now that I’m older, I’m sort of more aware of myself, and I feel like it’s there. I didn’t notice it before, but I do think it’s still there. And no matter what we are, celebrity or not, I don’t think that is shielding us from that sexism. It’s better than it was 30 years ago, and Susan [Feniger] and I are smarter than we were, but I think a lot of the women that are out there working in the industry that are friends, feel that it’s better. But, it’s there. I don’t think it’s gone. Q: It says a lot that even someone with your influence still faces these issues. A: I was introduced to a lot of international women’s issues through Oxfam, and then I got really into the global food system, so I’ve also worked to try to help and look at the problems of women all over the globe. Women in the United States are very lucky. I was in Pakistan for two week, working with young women entrepreneurs who want to work in the food business—I was giving kind of entrepreneur seminars on how to run a little catering company out of your house. In Egypt, there were women who, I was so impressed, they had this one street with all pigeon restaurants, where they just served squab or pigeon, which I love, and then the women, they had pigeon coops on the top of their homes and apartment buildings. They would cook the pigeons and clean them, and then bring them to the restaurants, and these guys would serve them. They did all the work. It was really very interesting. We definitely have the glass half full in the United States on women’s issues. Q: Through your international work, have you seen a growing interest from women entrepreneurs to start food businesses all over the world? A: I think so. I mean the reason that Susan and I opened our own little, tiny 900-square-foot restaurant in 1981 with nine tables and a bar that seated 12 people was because we didn’t want to answer to a man. We wanted to be our own bosses, and even if that meant that we had to go from working as a sous chef in a 100-seat, three-star French restaurant down to a little tiny cafe serving salami sandwiches at lunch, so we could express our creative culinary creations at night, one special a night, that was okay with us because the trade off was that we didn’t have to answer to anyone. Q: Is seeking ownership your advice to women? Or is different for everyone? A: I think it’s different for all women, but I do think that the biggest factor is confidence. I really do. As women, we have to raise our daughters and our grand kids and our nieces to think better of themselves, to think that they can do anything, which is why I’m so excited to get Hillary into office, but I don’t know if we will. I mean when you think about it, it’s 2016, and we’ve never had a woman leader of this country. That’s crazy. Q: It’s hard for women, but even harder for women of color in the industry. Do you think encouraging diversity is important? A: I think it’s very important, and it’s funny how you change and grow as you mature. Probably, when I was high-school, college age, I didn’t think that people needed a leg up. I thought that people had an equal opportunity, but now, I feel differently. I really think it’s important for just that reason I was talking about—we’re setting examples for our children and grandchildren and nieces, and you know, all those girls who are growing up, and they see people like Nyesha Arrington or people like Anita Lo. I think when they see that, it creates possibilities in their minds. I think we need to curate a society where things look the same as the population because I think that, to me, it’s common sense. That’s what would be the most productive. Q: You say you’ve seen improvements for women in the industry. Are you encouraged by these improvements, or are you discouraged that it hasn’t gone as fast as you expected? A: I feel encouraged, I do. I’m that kind of person; I’m an optimist anyway. I feel really like we’re on a good track, and things are moving in the right direction. I’m excited. Our industry is transforming, going through a huge transition around the minimum wage and tipping, and I think that that’s going to be exciting because the restaurant industry is sort of the last bastion where people are really overworked and underpaid, and you know women would have to flirt with their customers to get a bigger tip, or they could flirt with their customers to get a bigger tip. And dishwashers—we really have, on the backs of some very hard working people, built our industry. It’s time for us to transition to be a grown-up industry. Not to be teenager-y anymore and just half-assed doing it, so I think I’m excited about that. It’s going to be a little bit rocky because the bottom line is that people have to pay more for their food experiences. They have to because we have to pay our people more, and we want to. We want them to be insured, we want all that stuff, but we can’t do it on prices that are so low. The Women Restaurateurs As part of the WRC conference, the Women Who Inspire Awards is open to the public. Tickets can be purchased a la carte online. Attendees get to rub shoulders with some of the nations best chefs and sample food from Akasha Richmond, Amy Berman, Valerie Gordon, and Border Grill’s executive chef Michelle Lainez among others.